In response to the growing number of Ethernet Inline Appliance Applications, Shore Microsystems developed bypass technology in 1998 as an offspring of the highly successful Link Protector®s. The Shore Microsystems Bypass Switch was the first Ethernet Product to perform this function and has evolved to become the industry standard for Copper and Fiber bypass applications. 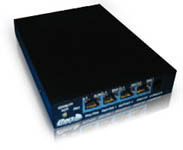 Shore Microsystems Bypass Technology has been utilized by the following appliance manufacturers to protect their customers from inline downtime: Cisco - 4200 Series Sensors, TippingPoint - IPS, TopLayer™ - IPS, Juniper - IDP Series, Sourcefire® - IPS, Check Point® - IPS, McAfee® - Network Security Platform, Symantec™ and Radware. Click here to see how Shore's Bypass Products along with Cisco's IPS Line can help protect your critical network.